Reference for Original Presentation: Stumpf, R. P., K. Holderied, J. A. Robinson, G. Feldman, N. Kuring. Mapping water depths in clear water from space. Coastal Zone 03, Baltimore, Maryland, 13-17 July 2003. Knowledge of water depth in clear water in shallow habitats, such as coral reef environments, is required at scales from the global to the local. Extracting depths from data from a variety of satellite sensors allows the possibility of examining and mapping shallow water at all these scales. A new algorithm to simplify depth determinations may be applied to sensors such as SeaWiFS, Landsat, and IKONOS, and digital photography from the International Space Station (ISS). The method can provide detail on structure independent of bottom albedo, allowing new information to be obtained from each platform. SeaWiFS provides a capability for global mapping with 1-km pixels, which is comparable to the accuracy of a number of the maps on which the currently global coral reef map is based (Spalding et al., 2001). Landsat, with 30-m pixels can provide regional data which can help find banks and characterize massive atolls. IKONOS, with 4-m pixels, provides the detail necessary to map morphology and features relevant to coral habitat mapping. Space Station photography offers pixels of 6-10 m, and additionally could provide repetitive imagery for cloud removal and change analysis. These data sets are being developed and will be incorporated into a common database for improved understanding of coral habitats. Our knowledge of the global distribution of coral reefs has improved dramatically with the development of coral reef databases [Spalding et al., 2001; (http://www.wcmc.org.uk/marine/data/coral_mangrove)]. These products have involved digitizing positions of reefs from a wide variety of sources, generally at a resolution of about 1:1,000,000. Remote sensing capabilities have also been suggested as a means to increase the information by better describing the areal extent of shallow water habitat (Robinson et al., 2000). Imagery delineates features and provides spatial detail. However, extracting quantitative information, rather than visually interpreting imagery, has been problematic. Much os the relevant structure and location of coral reefs depends on water depth. Therefore characterizing water depth in tropical oceans can improve identification and characterization of coral reefs. Several papers have provided demonstrations of the use of data sets at different resolutions for viewing coral reefs (Stumpf et al., 1999, Robinson et al., 2000; Andrefouet and Robinson, 2003). These range from SeaWiFS (Sea-viewing Wide Field-of-view Sensor), to Shuttle and Space Station photography. Digital cameras and long lenses (400 to 800 mm) are now being used on the ISS (Robinson and Evans, 2002). Recently Stumpf et al. (2003), developed an algorithm, originally applied to 4-meter IKONOS imagery, could be applied to other instruments with blue and green bands. Here we present examples of water depths obtained from data sets obtained from SeaWiFS, IKONOS, and ISS digital photography. IKONOS was processed as described in Stumpf et al., (2003), with corrections for surface glint, atmosphere, and conversion to water reflectance. Bathymetry was estimated using the blue and green bands. SeaWiFS was processed using the standard non-iterative atmospheric correction, and the equivalent bands, 490 nm for blue, and 555 nm for green, used in the IKONOS algorithm. All non-cloud SeaWiFS data for the five year mission was binned in 0.01 degree bins, and the median depth in each bin was used for the final product. The ISS digital photography was calibrated to reflectance against IKONOS using reference areas in the Hawaiian islands and the blue green bands were used in the IKONOS depth algorithm. Figure 1. SeaWiFS map depths for the Florida Straits region. Depths shallower than 0.3 meters in south Florida (upper left) are invalid due to frequent turbidity events. The global SeaWiFS data set provides a reference map for locating reefs and other remotely sensed imagery. 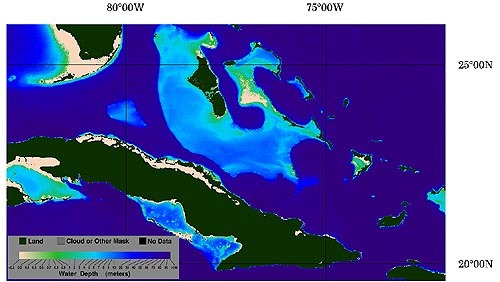 This data set may be found at http://oceancolor.gsfc.nasa.gov/cgi/reefs.pl. An example data set for the Florida Strait area appears in Figure 1. The shallow water of southwest Florida (upper left), tends to be relatively turbid. Turbidity produces a false shallowing, such that the depths are underestimated (leading to the depth estimates of 0.1 meters). Other depths are consistent with those determined from nautical charts. Figure 2. Water depth from IKONOA for Pearl and Hermes Atoll in northwestern Haxaiian Islands. IKONOS imagery is being used for habitat maps of the northwest Hawaiian islands. Water depths are an important component of that effort ( Figure 2). These depths have been validated to be accurate to within about 30% against lidar. An example of water depths derived from the ISS digital photography appears in Figure 3. While the depths are not quite as accurate as those from IKONOS, they are still consistent over a variety of water depths and habitat types. The shallowest depths are most problematic, as the photography does not have the near-infrared band, so the red band must be used to compensate for surface glint. Figure 3. Water depth for Pearl and Hermes from digital camera with 400 mm lens onboard the International Space Station. Depths extracted along profile lines are shown in Figure 4. Figure 4. 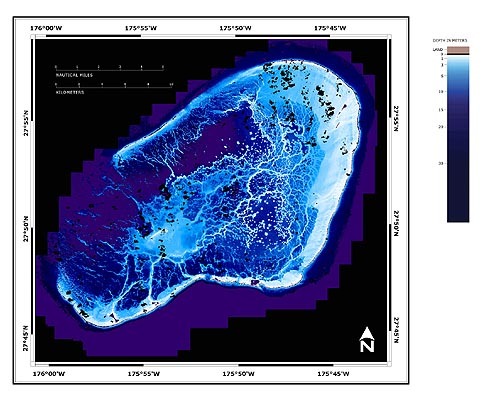 Water depth from LAD's lidar (Stumpf et al., 2003); IKONOS as shown in Figure 2 and ISS digital photography along profile lines in Figure 3. Box in Figure 3 indicates the 7,000 m end of the line. The methods described here are being refined for standard processing of imagery. The water depths can be estimated from any sensor with blue and green bands. As indicated by the results from the ISS digital photography, even a three-band digital sensor can provide good information on depths. A combination of sensors can offer greatly improved detail on the structure of coral reefs and othe shallow water features, a global mapping capability, and the potential to monitor changed in these environments. Trans., American Geophysical Union, Volume 83, Number 17, pages. 185-188. California Press, Berkely, California, 424 pages. imagery over variable bottom types. Limnology and Oceanography, volume. 48(1, part 2), pages. Encounter, volume 26, pages. 29-30.